Edit: Apparently this isn’t working atm, I’ll look into it when I have a chance to sometime today. The latest Dragon’s Den show is up online for you to download, as Valentine’s Day approaches rapidly. Oh, they also discuss some new game called Sonic The Hedgehog 4. 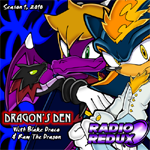 Dragon’s Den is up and running, in the lovey dovey month of February Blake and Ram discuss Valentines Day, Sonic 4, music and more all between several internet deaths, corrupted files and basically the Murphy’s Law of Podcasts. Oh and Sofia insults the audience…a lot…YOU’VE BEEN WARNED!